Now Crimean protesters stormed the building of the Crimean Supreme Council. It is here where we are seeing great conflict. There are pro-Russian activists and also Crimean Tatars whose number is a lot greater than the pro-Russians. In the square in front of the Supreme Council (Parliament) building there was about 2,000 Tatars and their number is increasing all the time. They are shouting: “Glory to Ukraine!” “Glory to the Heroes!” “Crimea is not Russia!” and are signing the National Anthem of Ukraine and applauding. The leader of the Crimean Tatars Refat Chubarov is also there. Many law enforcement officers are also there and they are lined up in two columns in between the rallies, apparently to avoid the violence. However, they are throwing stones and bottles at each other and this is getting very complicated. There are a lot of Russians in Crimea because of the port. However, the Tatars go back hundreds of years and are a people who go back to Mongol times and simply just stayed. Therefore, we have Ukrainian, Tartars, and Russians all in Crimea yet political interests from Russia given the port. The Tartars are Muslim so we have another element entering the mix. 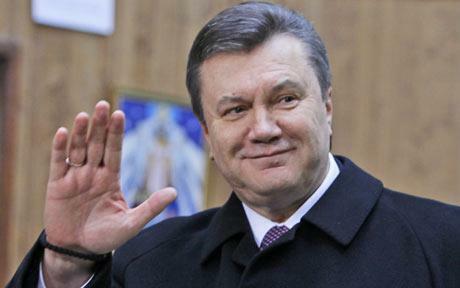 Yanukovych and his two sons fled and made it to Russia. This is a serious development for it will provide the excuse for Russia to install the “rightful” supreme ruler of Ukraine. This further demonstrates the criminal behavior of Yanukovych and his sons who started the extortion operation for why would they need to flee if there were no involved?